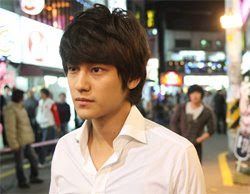 Actor Kim Beom of the “Boys of Flowers” fame is emerging as a new Hallyu star. His new film “Flight (Korean title Bisang)” has been sold to Japan even before the filming began. Japanese investors, Glory Entertainment and World Apple Corp., purchased the rights to the film’s theater presentation, DVD, and merchandising rights, demonstrating their affection and trust for the young actor. In addition to the film, Kim’s new drama, “Dream,” to be aired later this year has also been sold to Japan, as well as TV shows and movies he formerly appeared in. If Bae Yong-joon and Choi Ji-woo represented the first generation of Hallyu, Kim Beom is expected to lead the second wave of Korean pop culture in Japan. While the fans of the first Hallyu generation consist largely of homemakers in their 30s and 40s, those for Kim are much younger, from teenagers to women in their 20s. Kim’s new film “Flight” is about the emotional conflicts experienced during adolescent years. The film is expected to generate positive feedback from Japan, given that it talks about common concerns of young people everywhere. “Flight” is due for release later this year. I like Kim Bum since BOF. Looking forward for his new show.